This set of magnetic tool holders keeps tools, utensils, and other gear right where you want it—within reach and neatly organized, too. Strong neodymium magnets anchor flexible but sturdy silicone bands and can hold up to three pounds on a magnetic surface. 3/8" and 1/2" bands can hold up to 2 lbs., 3/4" band can hold up to 3 lbs. Dimensions: 4.125" x 1.125" x 4.25"
Yay! Can put anythin anywhere! Have placed all my emergency flashlights right where I need them! Screwdrivers, too!! They are perfect for my application. These are too small for many tools and definitely dont work with heavy items. Miguel Macias created this magnetic tool holder because of his own need for one. The avid weekend mechanic was forever reaching for screwdrivers and wrenches and had no convenient place to keep them. With design help from his cousin, Marco Galli, they made StickQuik to do the tool-holding job. The small but mighty little bands can help outside of the garage, too, by holding gardening gear, kitchen utensils, art supplies and more. Powerful neodymium magnets keep the holders firmly in place—on a car, workbench, or shelf—right where you need them, and can bear weight up to three pounds. 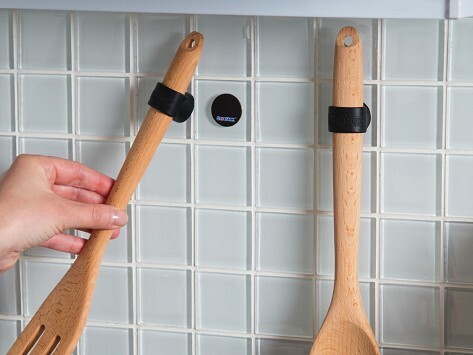 And if you want to use a StickQuik on a non-magnetic surface, the included metal stickers let you anchor the handy little holders just about anywhere.